I was looking forward to seeing this exhibit in NY but was underwhelmed. Your last line echoes something similar that I felt. Although the manner in which I saw the films didn’t really help in properly assessing the material either. There were multiple screens/panels in different rooms playing the 4 segments in a loop, so whenever I walked into a room, I caught a segment midway or near the end. I then waited until it was over before I could start seeing from the start. In your case, were the segments shown one after the other? Also, a few years ago I had seen a documentary Full Battle Rattle which showed the simulation nature of the military training in the Mojave desert. I felt I learned more from that film although that film didn’t have much video game training aspect. What I found more rewarding were the tv’s located in each room which had a catalogue of almost all of Farocki’s films. I spent more time watching some of his older films which I felt were more focussed and singular in examining their subjects. Yes, Sachin. Luckily, it was a traditional projection and played out like a movie, interspersed by a lecture by Farocki, who was present at the venue. It sets a lot of thoughts in motion, but I couldn’t help but feel it boxed itself in from the word go. I heard about Serious Games I–IV when it premiered at the MoMA and thought it sounded fascinating. I haven’t seen it but am a little disappointed from reading the responses (including yours). 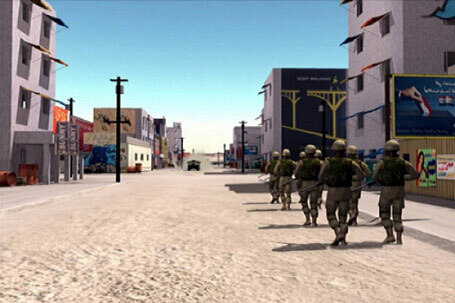 Farocki has produced many great films, including the brilliant Images of the World and the Inscription of War. I still hope to catch it if it ever arrives to Richmond. I’m sure it has its takers (NYT has praised it to the skies), but, as much as I think it opens up a lot of questions, I felt it needed a more outside perspective. Farocki’s incisive criticism of the media just does not hold good in this case.